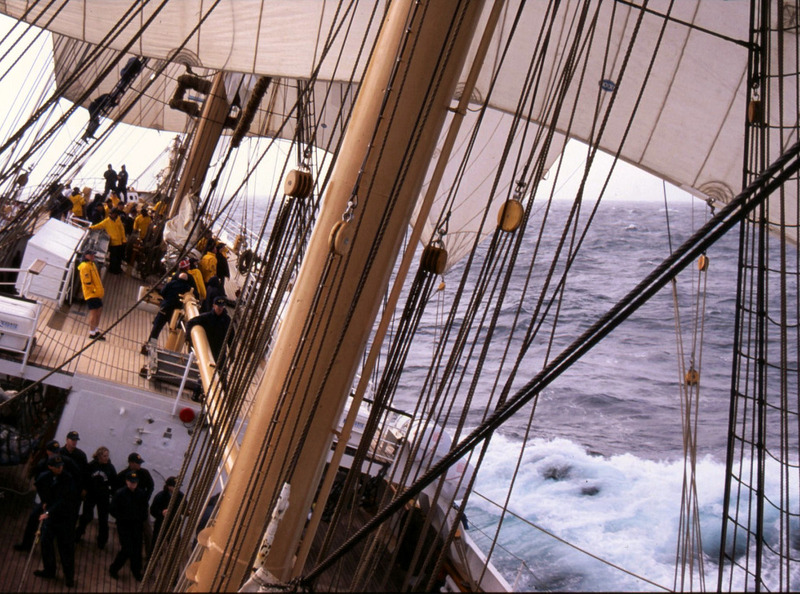 Recently Kimball posted a moving and fascinating personal log of sailing aboard the US Coast Guard 295-ft sail training ship EAGLE. (…) Throughout our three-day passage from Portland to the Golden Gate, the ship received visits from service helicopters and cutters, all eyes out to see the Eagle. Their Eagle. I began to get it. What’s hard to put into words. Eagle is magic. On our last day out the wind piped up and the old girl was hauling the mail . . .
We greatly enjoy Kimball’s writing. This piece is a wonderful example, which Kimball has annotated with a number of his original photos. (…) Through the Coast Guard Foundation, I met remarkable people. One of them was Lieutenant Commander (soon to be promoted) Alda Seabrands. She was called in for the shouting at a Foundation fundraiser. Just don’t miss it – get on over there. What is this America’s Cup World Series? The America’s Cup World Series is the series of events that leads up to the main event in August 2013. Eight events are being scheduled between now and August 2012 when the AC 72s debut on the Bay. Although they haven’t been announced yet, our guess on the venues for these events is that there will be events in Italy, Dubai, Auckland, Newport, RI, Scandinavia, France, and maybe a second one at any of those places. The first AC45 is under construction in New Zealand, hopefully launching before y/e 2010. Boat No.1 slated to hit the water in December. America’s Cup Regatta Director Iain Murray today inspected production of the new AC45 catamaran class. The AC45 is the little sister with attitude to the AC72. Both classes are fundamental parts of the transformation of the America’s Cup. 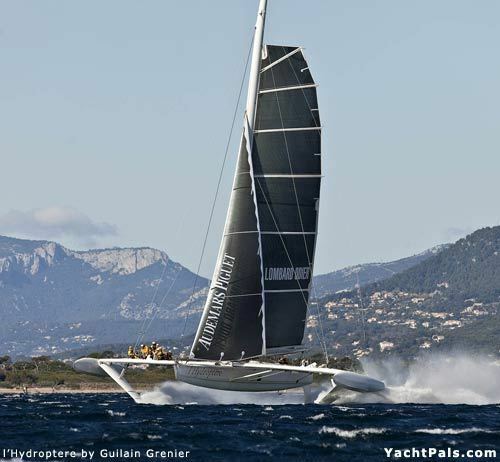 • Fast-track teams for the 34th America’s Cup to a common level of catamaran sailing and wingsail technology at the outset of their campaigns. • Provide a class of boat for the 2011 season of the new America’s Cup World Series. • Provide a class of boat for the Youth America’s Cup commencing in 2012. The AC45 was designed and engineered by BMW ORACLE Racing on behalf of the America’s Cup community. Manolo Ruiz de Elvira led the hull design development, Scott Ferguson the wingsail development, and Dirk Kramers the structures team. Mark Turner and Tim Symth of Core Builders, Warkworth, created production tooling for the hull platform and wingsail, and will produce the initial batch of boats in collaboration with other New Zealand marine industry specialists including Cookson Boats and Hall Spars NZL. Steering and daggerboard assemblies have been sub-contracted to C-Tech Carbon Technology and Craig Stirling Composites Engineering. The AC45 is a versatile, one-design class with controlled costs and ease-of-maintenance a priority. The hulls and cross-beams are designed for simple and fast assembly to accommodate the active racing schedule. The one-design wingsail consists of two elements. It is a scaled down concept of the 223-foot tall wing that powered BMW ORACLE Racing’s trimaran USA to victory in the 33rd America’s Cup Match. The wing will have simple, manual control systems. There will be two headsail options, a gennaker and jib, but no Code 0 headsail. Keeping with the simplification theme, the AC45 will have straight daggerboards. No articulation beyond raising and lowering is permitted. Crews are likely to number five at an average weight of 85 kilograms (approximately 187 pounds) to fit the AC45’s future role in the Youth America’s Cup. Cookson Boats and other key suppliers have been engaged to work with Core Builders to ensure swift production of the first batch of boats at a rate of two a month. Another designated boatbuilder in the USA or Europe is envisaged. Boats will be delivered in sequence of ordering. After use next year in the ACWS, the AC45 will be used for the Youth America’s Cup, a series to be run in 2012 in conjunction with the ACWS. Kevin Smith of Maple Leaf Adventures explains brilliantly why BC wins by viewing bears instead of killing bears. (…) I am a businessman, and my growing business is part of a growing industry called bear viewing. What if we get rid of all the emotional baggage and simply look at the almighty dollar and the irrefutable bottom line? In 2010 is a bear worth more living or shot dead? (…) This is a high-value industry. We offer a hard-to-get wilderness experience that is highly sought, and described by many as the “experience of a lifetime”. It is expensive for us to provide, and I estimate that at least 80 cents of every dollar we earn is rolled right into the B.C. economy in the form of wages, trip operations, maintenance, supplies, permits and other expenses. These businesses are also almost 100% B.C.-owned. This industry is based on a “renewable” resource: great viewings of healthy, wild bears. It is low impact and thrives in areas where conservation of natural areas is in place. In fact, it is a poster child for the “conservation economy” in the Great Bear Rainforest. It is sustainable over the long term, based not on a boom-and-bust model but one of steady, long-term use. (…) In 2003, Integral Economics conducted a study that compared the economic impact of the then-nascent bear viewing industry in B.C. with that of the industry that offers a commercial hunt and kill of grizzly bears for trophies (not food). At this time, the bear viewing industry was extremely young. Many businesses were just getting started. The number of multi-day adventure cruises featuring bear viewing could probably have been counted on one hand. I know because I run one of them and knew everyone else. Yet, at that time, the researchers found that for ecotourism operations involving grizzly viewing, total revenues directly attributable to the presence of grizzlies were then approximately $6.1 million annually. Guide outfitting operations with a grizzly hunt component, in comparison, generated only about $3.3 million dollars from grizzly hunting activities. In fact, a single bear viewing business at that time generated as much revenue as all grizzly hunt companies combined! (…) Technology returns to the fore with the AC72 wingsail America’s Cup catamaran, capable of regularly exceeding speeds of 30 knots. The AC72 will excite fans as it zips around the racecourse with one hull in the air. Equally important, it will leave the crews exhilarated and drained after a day of adrenaline-fueled racing. Crucial to the new boat is its ability to be raced hard in light and strong winds, a necessary development to do away with the frustrating delays of racing because of not enough wind or too much. Fast to grab and retain the attention of a new audience, it also had to be technically stimulating to design and physically demanding for the crew to sail. There will only be 11 crewmembers, six fewer than the heavy-displacement ACC monohull it replaces. The new class of America’s Cup catamaran is a tightly defined “box rule.” Certain parameters have been set, such as overall length, beam, displacement and sail area. Other factors are limited to keep the competition close across all wind speeds. So that no team would have an unfair advantage by creating the rule, US SAILING and Morrelli & Melvin Design & Engineering authored the rule. “Near the beginning of the process we were requested to look at a catamaran instead of a trimaran because it’s easier to transport, assemble and disassemble,” Melvin said. “The difference in the performance characteristics is not significant, and a cat was judged less expensive to build. From there, the experience of two America’s Cups in which wingsails were used (1988 and 2010), coupled with the latest developments in wingsail technology, made it natural to morph the design rule into a catamaran with a wingsail,” said Melvin. Read more » Note: Morrelli & Melvin are the designers of our ADAGIO. We are hopeful that San Francisco Bay will be chosen as the venue for AC34. 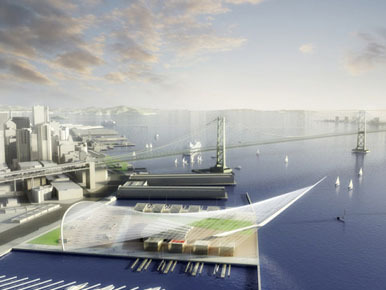 Below is the Skidmore rendering of the proposed America’s Cup Village. Maple Leaf Adventures "photo of the month"
Kevin and Maureen are curating a series of remarkable photos taken aboard S/V MAPLE LEAF on their Alaska and British Columbia adventure cruises. The photos and the cruises are the real deal, check it out.